Delerium Records germinated in 1991 when Richard Allen (Free Festival frequenter, Freakbeat magazine co-editor and music columnist for Oz/It revivalist’s Encyclopaedia Psychedelica) was encouraged by the legendary US journalist/rock maverick Greg Shaw to establish a label to release music by psychedelic bands that had emerged in the UK during the late 1980s neo-psychedelic revival. Unlike many of their US and European counter parts - many of whom aped the look and sound of ‘60s but added little originality - UK bands were the direct inheritors of a tradition that had its creative roots buried in the original 1960s psychedelic explosion. The DNA of that earlier era had survived through the 1970s anarchic Free Festival circuit informing the mutant sounds of the 1980s and early 1990s underground. The underground of the 1980s was a culturally diverse alliance that encompassed, Hippy, Punk, Goth, New Age Traveller, Rasta, Rockabilly, Retro –Rocker, ‘60s revivalist and Mod. This important part of UK musical history has somehow escaped the attention of rock historians and was a colourful and eclectic grouping that would eventually give birth to its muddy brown offspring, The Crusty - Neanderthal inheritor of rock and roll tribalism. These distant relations gathered annually at Glastonbury Festival (then still an underground event rather than today’s corporate rock showcase) and most importantly at Stonehenge Free Festival, a week of unhindered musical escapism next to the ancient monument in the middle of a Salisbury plain. The brutal police banning of the Stonehenge Festival in 1985 scattered the various tribes, who retreated to secret urban venues like London’s legendary Alice In Wonderland (organises of the proto rave/acid test like Magical Mystery Trips) The Sugar Lump, The Kerouac Club, Club Dog and Deptford’s Crypt Club (which saw early performances by the likes of the Spacemen Three). With the coming of Acid House in the late 1980s the remaining tribes were absorbed into the exploding free party and rave culture, the last great reactionary musical youth movement to emerge from the UK. In 1991 along with Freakbeat founder and Syd Barrett expert Ivor Truman, Richard Allen put together Delerium Records first release, a compilation of international recordings entitled Psychedelic Psauna that release brought together a diverse selection of psychedelia and garage rock unconnected by style but linked wholly in spirit. It included the first CD/LP appearance of the hugely popular Free Festival band Ozric Tentacles as well as the first commercial release by the mysterious Porcupine Tree, then the bedroom project of a very young Steven Wilson. The compilation caught a wave and within weeks had sold over 6000 copies with no press coverage. Between 1991 and 2004 Delerium issued not only the core catalogue of the now world famous Porcupine Tree, including their much loved albums The Sky Moves Sideways and Signify, but also ensured that a number of important underground UK bands from the 1980s and 1990s were able to secure a recorded legacy including Omnia Opera, Moom, The Aardvarks, Treatment, Nukli, Mandragora, Sons Of Selina, Praise Space Electric, Dean Carter and Zuvuya. Driven entirely by Allen’s love for the unfashionable and experimental, Delerium also signed up international artists including US freak folk pioneer Jeff Tarlton (ex Viv Akauldren) Germany’s neo-Kraut Rock Electric Orange, Italy’s Kryptasthesie, Irish Americans The Steppes as well as two albums featuring Terence McKenna - the late and legendary ethnobotanist. Delerium sub-label Molten released the first two albums by UK heavy rock stoner trio Josiah and key albums by Danish acid rock band On Trial - members of which would later form the acclaimed garage band Baby Woodrose that briefly signed to WEA. 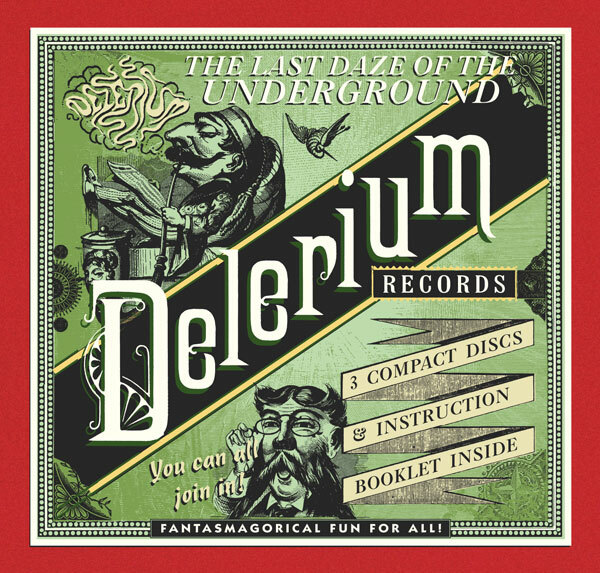 Delerium was perhaps the last label of the UK underground that could directly trace its cultural lineage from the 1960s right through until the late 1990’s. Digital technology would change forever the way that music is promoted, lessening the importance of traditional radio exposure and off peak specialist radio and gradually devaluing music as a cultural force. Delerium Records whilst in no way near the same scale as early Island, Virgin, Vertigo or Harvest, had aspirations to achieve the same kind of eclectic mix. Like those labels Delerium was not afraid to ride against the fashionable mainstream releasing a broad range of music that carried no favour in the music press but had a strong grass roots following. Delerium was at heart purveyor of a countercultural musical movement whose values were not expressed in terms of mere chart position. "You are on camera , you are on screen, big brother is watching you this is no dream". "Last Daze of the Underground"
Includes the unique short version of Porcupine Tree’s ‘Radioactive Toy’ unavailable elsewhere.